The Bell 206B-1 Kiowa helicopter was a light reconnaissance helicopter acquired by the Australian Army in 1971. 12 were built by Bell Helicopter at Fort Worth, Texas with the remaining 44 produced under license by the Commonwealth Aircraft Corporation in Melbourne. The RAN acquired four Kiowa’s, from the Army in mid-1973, to replace the Westland Scout and allocated them to 723 Squadron which operated the aircraft from the hydrographic vessel HMAS Moresby, from February 1974 onwards, on survey duties in remote parts of Australia. Kiowa 891 crashed on 28 July 1977 near Sunday Island, Western Australia while recovering one of the survey ship’s crew from the top of a cliff. The man jumped aboard the helicopter which then became unbalanced and its rotors struck the cliff face causing the helicopter to crash at the base of the cliff. 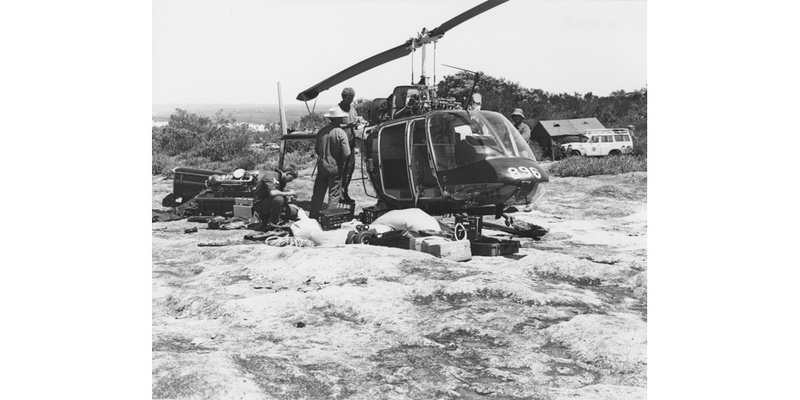 The aircrew (Lieutenant Neil Jackson and Aircrewman Anthony Mason) and the passenger survived but the helicopter was destroyed and was later replaced by a Kiowa transferred from the army. Another Kiowa (896) was lost on 14 April 1986 while also operating from Moresby. The helicopter ditched in Admiralty Gulf, Western Australia, due to engine failure. Altogether nine Kiowa’s operated with the RAN during the period 1973 - 2000 and apart from Moresby were also embarked on occasions in the frigates HMA Ships Adelaide, Sydney, Anzac and Arunta, the destroyer tender HMAS Stalwart, Landing Ship – Heavy HMAS Tobruk, and the training ship HMAS Jervis Bay. They conducted surface searches, photographic tasks, personnel transport and logistics re-supply duties as well as search and rescue activities. Operating from the Naval Air Station at Nowra the Kiowa was also used extensively to conduct ‘range clearance’ flights over the Beecroft Peninsula gunnery range - ensuring the area was clear of people and small boats prior to naval gunfire support exercises. They also conducted search and rescue missions, general transport flights, aerial photography tasks, open day flying displays and training of new deck personnel at the Flight Deck Training Unit. The Kiowa’s were finally phased out of naval service in September 2000; being returned soon after to the Australian Army that continued to operate them. The Squirrel helicopter subsumed the role at sea previously undertaken by the Kiowa. 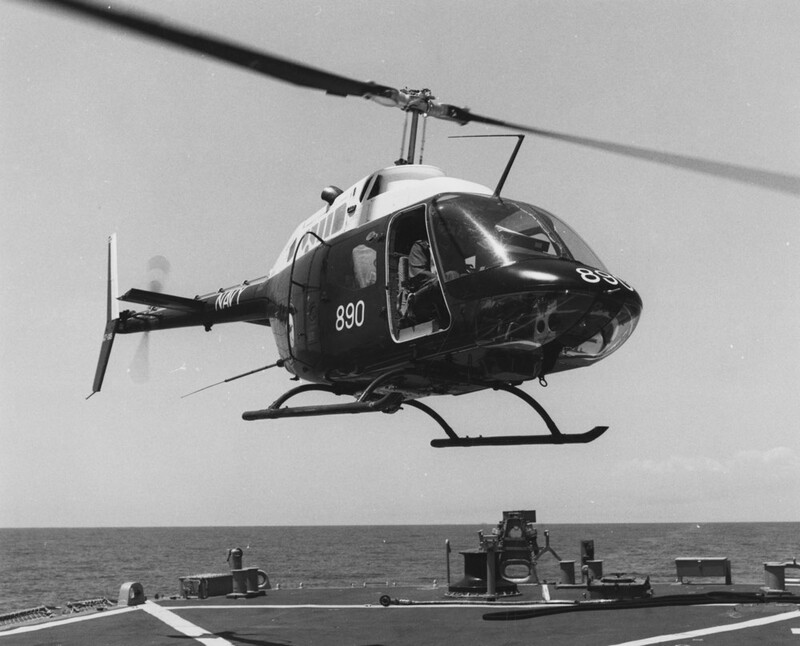 Left: A Bell Kiowa 206B-1 operating from HMAS Moresby off the Western Australian coast. Right: A Bell Kiowa 206B-1 on a training flight near Nowra. A Bell Kiowa 206B-1 on range control duties at Beecroft Peninsula, NSW receiving in the field maintenance.